NETWORK UPDATE: MODERN FAMILY gained 0.2 in final numbers, and both THE MIDDLE and THE GOLDBERGS climbed 0.1, although BLACK-ISH and NASHVILLE remained where they were. SVU found an extra 0.1, as did RED BAND SOCIETY (which still left the latter at a sad 1.1). The season premiere of SOUTH PARK (Comedy Central) towered over the rest of Wednesday cable at 1.44. That was great news for the rest of Comedy Central’s schedule post-10PM, with KEY & PEELE (0.97), THE DAILY SHOW (0.78), THE COLBERT REPORT (0.66) and AT MIDNIGHT (0.41) all in the day’s Top 10. The top non-Comedy Central show was TEEN MOM (MTV), down more then three-tenths from last week at 0.82 (its companion show VIRGIN TERRITORY remained steady at 0.28, underscoring how separate their audiences are). BRING IT (Lifetime) gained 0.09 to 0.59. THE LEAGUE (FXX) just moved a tick to 0.40, as did WAHLBURGERS (A&E) to 0.38, but THE BRIDGE (FX) lost 0.13, down to 0.28 in the next to last week of its season. 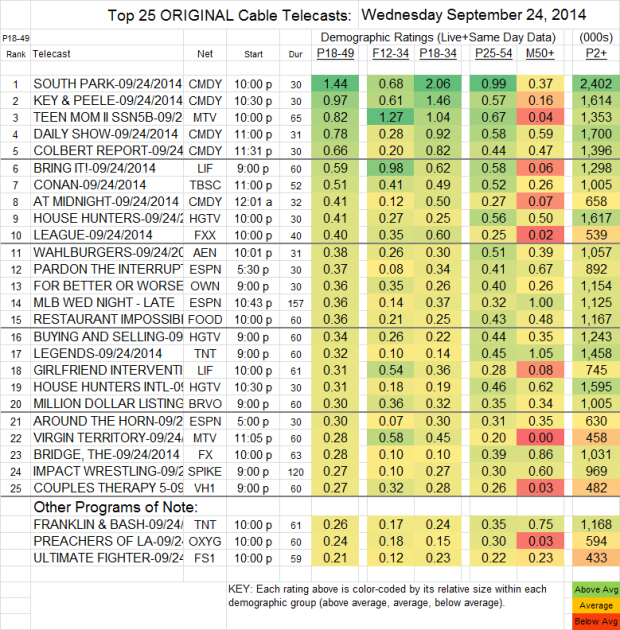 On TNT LEGENDS grew by 0.04 to 0.32, but FRANKLIN & BASH crashed by 0.14 down to 0.26.